The revocable living trust is a very useful and popular estate planning tool, recommended by tens of thousands of attorneys across the U.S. and used as the central estate planning document by millions of Americans. The primary benefit of the revocable living trust is that assets properly funded into such a trust are protected from the expenses and complexities of probate. However, what most Americans don't realize is that assets in a revocable living trust are NOT protected from lawsuits or from the catastrophic expenses associated with nursing home long-term care. Certified Elder Law Attorney Evan H. Farr, one of the nation's leading estate planning, elder law, and asset protection attorneys, has developed a unique Medicaid Asset Protection Trust called the Living Trust Plus™ -- a trust that functions very similarly to a revocable living trust and maintains much of the flexibility of a revocable living trust, but is designed to protect your assets from the expenses and complexities of probate PLUS lawsuits PLUS nursing home expenses. A version of this Asset Protection Trust can also be used by wartime Veterans to obtain the Veterans Aid and Attendance benefit. The Living Trust Plus™ Asset Protection Trust protects your assets from lawsuits, auto accidents, creditor attacks, medical expenses, and -- most importantly for the 99% of Americans who are not among the ultra-wealthy -- from the catastrophic expenses often incurred in connection with nursing home care. For most Americans, the Living Trust Plus™ is the preferable form of asset protection trust because, for purposes of Medicaid eligibility, this type of trust is the only type of self-settled asset protection trust that allows a settlor to retain an interest in the trust while also protecting the assets from being counted by state Medicaid agencies. you have the right to change beneficiaries. Additionally, as is the case with all non-charitable irrevocable trusts, the Living Trust Plus™ can be modified, or even terminated, upon the agreement of all "interested parties" -- which are typically the trust creator, the trustee, and all trust beneficiaries. I’m still healthy. Why should I care about avoid nursing home expenses? What exactly is the Living Trust Plus™ and how does it work? You say I can't have direct access to my principal. Does this mean I can have indirect access to the trust principal? I thought we were talking about an irrevocable trust? How can an irrevocable trust be revoked? What kind of people use the Living Trust Plus™ ? What assets can go into the Living Trust Plus™ ? Are there any assets that can’t go in to the Living Trust Plus™? Is there a diagram showing how the Living Trust Plus™ works? Certified Elder Law Attorney and Medicaid Asset Protection expert, Evan H. Farr, CELA, has written four books that have reached #1 on the Amazon Bestseller List. These books feature detailed information about The Living Trust Plus™. For more information, please search for the book title on Amazon.com. 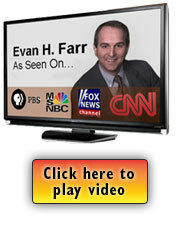 Evan Farr recently spoke about Living Trust Plus™ on various television and radio shows. Click on the links below to listen to the broadcasts.